Guitarist Eric DiVito‘s new album is The Second Time Around (PJC, 2013), featuring Corcoran Holt on bass and Alyssa Falk Verheyn on drums, with guest appearances by Mavis Swan Poole and Steve Wilson. In this interview, DiVito talks about his approach to standards; the recording session and what made it work so well; finding originality in arranging; and his take on a being a jazz guitarist. 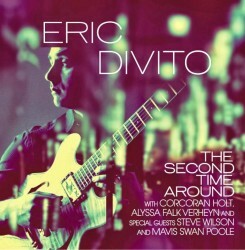 Learn more at ericdivito.com and follow him on Twitter at @ericdivitomusic. BUY this album in The Jazz Session store and a portion of your purchase price will benefit the show. Note that you can click on a link in the store and then buy anything you want, and a portion of whatever you buy will help the show. Thanks!